The PCI-FC16U is a 32-bit hardware-type high-speed Counter/Frequency board that supports both the 3.3 V and the 5 V Universal PCI bus. The card provides 16 channels that can be individually configured for either frequency measurement or up-counter applications, and can support high-frequency signals up to 250 kHz. The PCI-FC16U board also includes 32 programmable Digital I/O channels. The PCI-FC16U board includes an onboard Card ID switch that enables the board to be easily recognized via software if two or more boards are installed in the same computer. The pull-high/pull-low resistors allow the DI status to be predefined as either high or low instead of remaining floating if the DI channels are disconnected or interrupted. 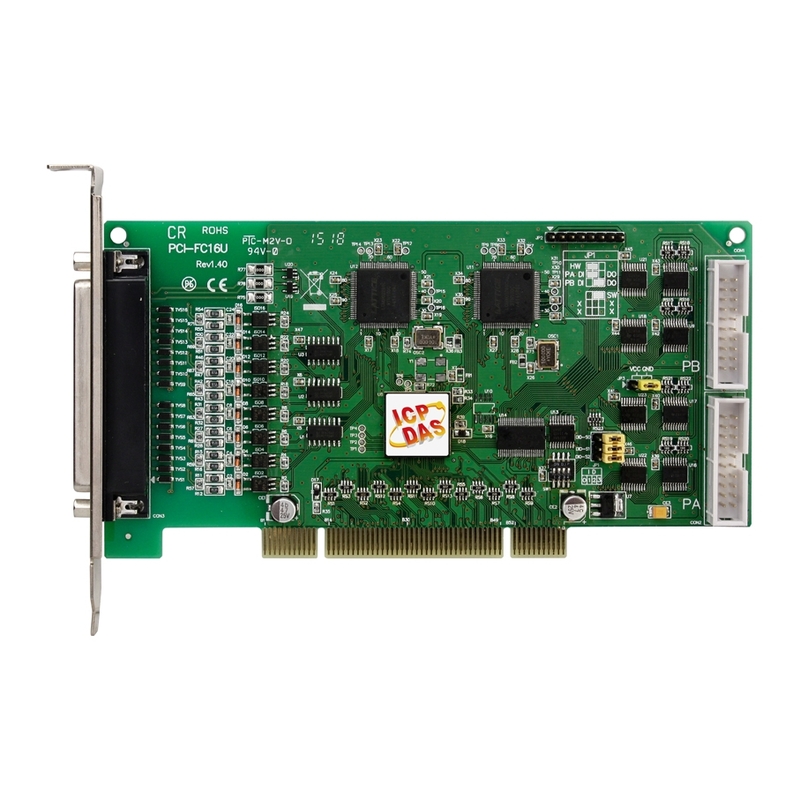 The PCI-FC16U board supports a variety of operating systems, such as DOS, 32-/64-bit Windows XP/2003/2008/7 and Windows 8. ICP DAS also provides a DLL and Active X control for the PCI-FC16U, together with sample programs in various languages, including Turbo C++, Borland C++, Visual C++, Borland Delphi, Borland C++ Builder, Visual Basic, C#.NET, Visual Basic.NET and LabVIEW, enabling help users to quickly and easily develop their custom applications. Supposed that duty cycle = 50%, refer to Minimum Pulse Duration of High Level, we have pulse period = 2 μs x 2 = 4 μs, which is 250 kHz as a max. Refer to Min. Pulse Duration of High Level, Max. Frequency is highly affected by duty cycle. Power Consumption 700 mA @ 5 V Max.